(You’ll find most Seven Chances filming locations at this earlier post.) Now that the Keaton films are all available on Blu-ray, I not only continue to make new discoveries, but to my great satisfaction I am also increasingly able to place these filming locations into a broader context. As we will see, this scene below from Seven Chances (1925) was filmed just a few blocks away from Buster’s small studio. Buster eyes a potential bride walking south from Melrose down Rossmore. The premise of Seven Chances (see related post HERE) requires Buster to become married by 7:00 pm in order to inherit a fortune. Before Buster outruns an army of angry brides at the film’s climax, he approaches a number of random women on the street. In this “joke” above, Buster recoils after realizing the potential bride he approached from behind is actually an African-American. Although this joke is overtly racial (one of the few in Keaton’s oeuvre), modern audiences may not realize that at the time it would have been illegal for Buster to marry this woman. It was not until 1948 that the California Supreme Court struck down California’s anti-miscegenation laws, the first time since the Reconstruction that a state had declared such laws to be unconstitutional. Despite several clues, including the unusual curved street, and what appeared to be some type of church steeple (red oval) in the background, this setting eluded me for many years. But once I could read on the Blu-ray the 658 – 656 street numbers above the doorways during this scene, I realized it was likely filmed looking south from somewhere along Melrose Avenue, and eventually identified the setting as 658 N. Rossmore Avenue. Melrose is where the curved street Rossmore continues further north into Hollywood re-named as Vine Street. This matching circa 1938 aerial view at left looks south, and shows Buster’s path beside the retail stores (arrow), the small church built in 1922 at 600 N. Rossmore, at the time called the Rossmore Avenue Congregational Church (red oval), and the extant Rossmore Apartments, built in 1924, at 649 N. Rossmore Avenue (yellow oval). The yellow box marks Arden Place, a newer “Y” branch street addition that was not present in 1925, that runs from Rossmore into Arden Boulevard, and the larger and more modern Christ the King Catholic Church built in 1927. Also above to the left appear Harry Langdon and Vernon Dent, driving north up Vine from Melrose, in their 1925 Sennett Studio comedy His Marriage Wow. Their view looks south down Vine towards the same retail store (arrow), church (red oval), and apartments (yellow oval) on Rossmore, as in the left Keaton frame at the top of this post. 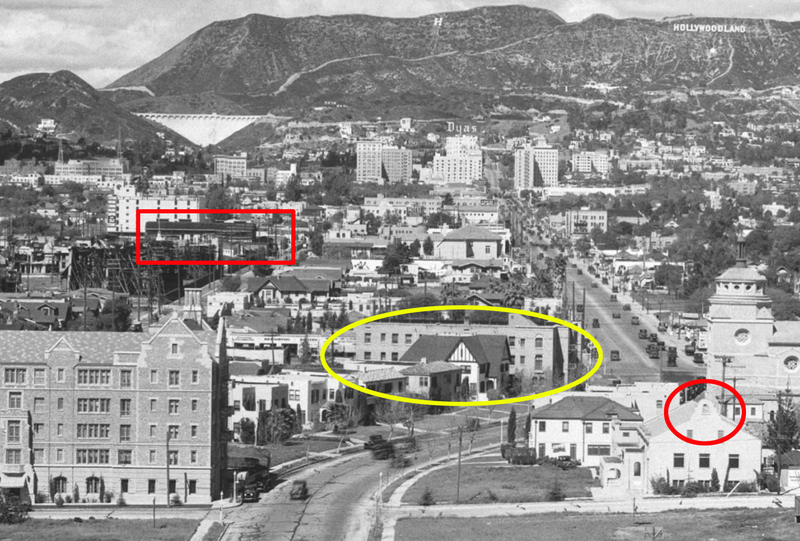 Above, matching then and now views south down Vine towards Melrose and the extant Rossmore Apartments. Below, the Rossmore Avenue Congregational Church building as it appears today. Seven Chances (C) 1925 Buster Keaton Productions, Inc. (C) renewed 1953 Loew’s Inc., licensed by Douris UK, Ltd. This entry was posted in Buster Keaton, Harry Langdon, Keaton Studio, Seven Chances and tagged Buster Keaton, Harry Langdon, Hollywood, Hollywood Tour, Keaton Locations, Keaton Studio, Seven Chances, Silent Comedians, Silent Comedies, Silent Movie Locations, Silent Movies, then and now. Bookmark the permalink. Great post! I travel that street all the time, who knew it actually appeared in a film? I especially love that photo showing the Hollywoodland Sign. Yes, that’s a great view north. The USC Digital Archive now has a web feature that allows you to zoom in on their images. That Hollywoodland view is actually just a small portion of the original photo. I just enjoyed the film today and loved seeing original Hollywood scenes. Thanks for your work. Actually, even if the laws had been struck down when Buster’s character was doing what he was doing, he still would have lost his fortune, because a mixed marriage between a black and a white was considered declasse among the wealthy set of the period (1920’s to 1940’s and even on into the ’50’s, ’60’s, and ’70’s-just look at what happened to poor Inger Stevens.) ‘Society’s Child’, indeed. In the north-facing image, also notice the single “H” on the Hillside, the next peak over to the left (west) of the Hollywoodland sign. It was for Hollywood High School, located at Sunset and Highland.